Conceived in 1999 as a brand to embody the best of African art, design, crafts and curios, Out Of Africa's product range encompasses stone, wood, bark beads and clay - expressing the ultimate in the continent's culture and heritage. Out of Africa takes travellers on a journey of authentic crafts, textiles, masks, sculptures, furniture and jewellery. It offers the whole continent of Africa in one unique shopping experience. Out of Africa is dedicated to social upliftment and job creation. Many of the products are handmade or produced and purchased from community development programmes. 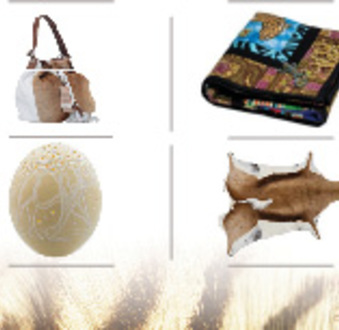 Products available for purchase on www.dutyfreeshopping.co.za include handcrafted products from Kaross, Fashion Sensitive Planet and Gone Rural. Every Kaross piece is 100% hand-crafted, the result of fine art and contemporary design translated through the traditional skills and creativity of the VTsonga people. Homebased employment is provided to 1 000 rural embroiderers in the northern Limpopo Province of South Africa. Fashion Sensitive Planet offers the best of South African design, expertly handcrafted in Cape Town by over 30 skilled artisans. Exquisite leathers and exoctic skins combine with innovative design and quality workmanship - by choosing an original African design you are fully supporting job creation. Gone Rural empowers women in some of the most remote areas of Swaziland. It started with just 30 and has now grown to support over 750 rural Swazi weavers. It not only provides income generation, Gone Rural boMake brings wellness, education and community development services to the artisans. www.dutyfreeshopping.co.za allows visitors travelling through Johannesburg's O.R Tambo International Airport to make Duty Free purchases online, 72 hours before departure - and collect their items at the airport before jetting off to their international destination. Registering on the portal is quick, simple and secure customers simply need to enter their ticket and flight details to complete the purchase and can then pick up their pre-packaged orders in the stores in the Duty Free area, from which they made their purchases. Out of Africa also offers worlwide shipping for purchases made via www.dutyfreeshopping.co.za or in-store, at an additional cost. Travellers who make their purchases online can visit the Out of Africa store in the O.R. Tambo International Airport Duty Free Mall to make delivery arrangements.